A. Y. Liu, S. Srinivasan, J. Norman, A. C. Gossard, and J. E. Bowers, “Quantum dot lasers for silicon photonics [Invited],” Photon. Res. 3, B1–B9 (2015). A. Y. Liu, C. Zhang, J. Norman, A. Snyder, D. Lubyshev, J. M. Fastenau, A. W. K. Liu, A. C. Gossard, and J. E. Bowers, “High performance continuous wave 1.3 μm quantum dot lasers on silicon,” Appl. Phys. Lett. 104, 041104 (2014). S. Chen, M. Liao, M. Tang, J. Wu, M. Martin, T. Baron, A. Seeds, and H. Liu, “Electrically pumped continuous-wave 1.3 μm InAs/GaAs quantum dot lasers monolithically grown on on-axis Si (001) substrates,” Opt. Express 25, 4632–4639 (2017). D. Jung, Z. Zhang, J. Norman, R. Herrick, M. J. Kennedy, P. Patel, K. Turnlund, C. Jan, Y. Wan, A. C. Gossard, and J. E. Bowers, “Highly reliable low-threshold InAs quantum dot lasers on on-axis (001) Si with 87% injection efficiency,” ACS Photon. 5, 1094–1100 (2017). Y. Wan, Q. Li, A. Y. Liu, A. C. Gossard, J. E. Bowers, E. L. Hu, and K. M. Lau, “Optically pumped 13 μm room-temperature InAs quantum-dot micro-disk lasers directly grown on (001) silicon,” Opt. Lett. 41, 1664–1667 (2016). Y. Wan, J. Norman, Q. Li, M. J. Kennedy, D. Liang, C. Zhang, D. Huang, Z. Zhang, A. Y. Liu, A. Torres, D. Jung, A. C. Gossard, E. L. Hu, K. M. Lau, and J. E. Bowers, “1.3 μm submilliamp threshold quantum dot micro-lasers on Si,” Optica 4, 940–944 (2017). N. Kryzhanovskaya, E. Moiseev, Y. Polubavkina, M. Maximov, M. Kulagina, S. Troshkov, Y. Zadiranov, Y. Guseva, A. Lipovskii, M. Tang, M. Liao, J. Wu, S. Chen, H. Liu, and A. Zhukov, “Heat-sink free CW operation of injection microdisk lasers grown on Si substrate with emission wavelength beyond 1.3 μm,” Opt. Lett. 42, 3319–3322 (2017). S. Chen, M. Tang, Q. Jiang, J. Wu, V. Dorogan, M. Benamara, Y. Mazur, G. Salamo, P. Smowton, A. Seeds, and H. Liu, “InAs/GaAs quantum-dot superluminescent light-emitting diode monolithically grown on a Si substrate,” ACS Photon. 1, 638–642 (2014). M. Liao, S. Chen, S. Huo, S. Chen, J. Wu, M. Tang, K. Kennedy, W. Li, S. Kumar, M. Martin, T. Baron, C. Jin, I. Ross, A. Seeds, and H. Liu, “Monolithically integrated electrically pumped continuous-wave III-V quantum dot light sources on silicon,” IEEE J. Sel. Top. Quantum Electron. 23, 1900910 (2017). Y. Wang, S. Chen, Y. Yu, L. Zhou, L. Liu, C. Yang, M. Liao, M. Tang, Z. Liu, J. Wu, W. Li, I. Ross, A. J. Seeds, H. Liu, and S. Yu, “Monolithic quantum-dot distributed feedback laser array on silicon,” Optica 5, 528–533 (2018). J. Wu, S. Chen, A. Seeds, and H. Liu, “Quantum dot optoelectronic devices: lasers, photodetectors and solar cells,” J. Phys. D 48, 363001 (2015). E. Tournié, L. Cerutti, J.-B. Rodriguez, H. Liu, J. Wu, and S. Chen, “Metamorphic III–V semiconductor lasers grown on silicon,” MRS Bull. 41, 218–223 (2016). M. Krakowski, P. Resneau, M. Calligaro, H. Liu, and M. Hopkinson, “High power, very low noise, C.W. 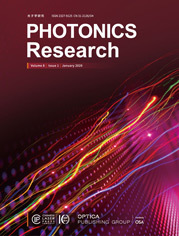 operation of 1.32 μm quantum-dot Fabry–Perot laser diodes,” in IEEE 20th International Semiconductor Laser Conference, Conference Digest (IEEE, 2006), pp. 39–40. A. Capua, L. Rozenfeld, V. Mikhelashvili, G. Eisenstein, M. Kuntz, M. Laemmlin, and D. Bimberg, “Direct correlation between a highly damped modulation response and ultra low relative intensity noise in an InAs/GaAs quantum dot laser,” Opt. Express 15, 5388–5393 (2007). A. Gubenko, I. Krestnikov, D. Livshtis, S. Mikhrin, A. Kovsh, L. West, C. Bornholdt, N. Grote, and A. Zhukov, “Error-free 10 Gbit/s transmission using individual Fabry-Perot modes of low-noise quantum-dot laser,” Electron. Lett. 43, 1430–1431 (2007). M. A. Tischler, T. Katsuyama, N. A. El-Masry, and S. M. Bedair, “Defect reduction in GaAs epitaxial layers using a GaAsP-InGaAs strained-layer superlattice,” Appl. Phys. Lett. 46, 294–296 (1985). A. Y. Liu, T. Komljenovic, M. L. Davenport, A. C. Gossard, and J. E. Bowers, “Reflection sensitivity of 1.3 μm quantum dot lasers epitaxially grown on silicon,” Opt. Express 25, 9535–9543 (2017). Y.-G. Zhou, C. Zhou, C.-F. Cao, J.-B. Du, Q. Gong, and C. Wang, “Relative intensity noise of InAs quantum dot lasers epitaxially grown on Ge,” Opt. Express 25, 28817–28824 (2017). A. Liu, R. Herrick, O. Ueda, P. Petroff, A. Gossard, and J. Bowers, “Reliability of InAs/GaAs quantum dot lasers epitaxially grown on silicon,” IEEE J. Sel. Top. Quantum Electron. 21, 1900708 (2015). M. Akiyama, Y. Kawarada, and K. Kaminishi, “Growth of single domain GaAs layer on (100)-oriented Si substrate by MOCVD,” Jpn. J. Appl. Phys. 23, L843–L845 (1984). M. Tang, S. Chen, J. Wu, Q. Jiang, K. Kennedy, P. Jurczak, M. Liao, R. Beanland, A. Seeds, and H. Liu, “Optimizations of defect filter layers for 1.3-μm InAs/GaAs quantum-dot lasers monolithically grown on Si substrates,” IEEE J. Sel. Top. Quantum Electron. 22, 50–56 (2016). J. R. Orchard, S. Shutts, A. Sobiesierski, J. Wu, M. Tang, S. Chen, Q. Jiang, S. Elliott, R. Beanland, H. Liu, P. M. Smowton, and D. J. Mowbray, “In situ annealing enhancement of the optical properties and laser device performance of InAs quantum dots grown on Si substrates,” Opt. Express 24, 6196–6202 (2016). “IEEE P802.3ba 40 Gb/s and 100 Gb/s Ethernet task force,” (2010). L. F. Lester, A. Stintz, H. Li, T. C. Newell, E. A. Pease, B. A. Fuchs, and K. J. Malloy, “Optical characteristics of 1.24 μm InAs quantum-dot laser diodes,” IEEE Photon. Technol. Lett. 11, 931–933 (1999). A. R. Kovsh, N. A. Maleev, A. E. Zhukov, S. S. Mikhrin, A. P. Vasil’ev, E. A. Semenova, Y. M. Shernyakov, M. V. Maximov, D. A. Livshits, V. M. Ustinov, N. N. Ledentsov, D. Bimberg, and Z. I. Alferov, “InAs/InGaAs/GaAs quantum dot lasers of 1.3 μm range with enhanced optical gain,” J. Cryst. Growth 251, 729–736 (2003). Fig. 1. (a) Bright-field scanning TEM image of the QD active layers. (b) PL comparison of InAs/GaAs QDs SLD structure grown on Si to a reference sample grown on native GaAs under the same pump conditions. The inset shows the representative AFM image of an uncapped QD sample grown on Si. (c) Optical micrography of rows of the fabricated narrow-ridge-waveguide laser. (d) Cross-sectional SEM image of the fabricated laser with as-cleaved facets. Fig. 2. Experimental setup of RIN measurement. ISO, optical isolator. Fig. 3. Experimental system for data transmission. PC, polarization controller; Amp., radio frequency amplifier; PPG, pseudorandom pattern generator; SMF-28, standard single-mode fiber. Fig. 4. (a) RT CW LIV curves for total power and single-mode coupled power from a 2.2 μm×2.5 mm narrow-ridge-waveguide laser. (b) Lateral near-field intensity profiles with different injection currents. Inset: infrared (IR) camera image of lasing near-field at the threshold of 20 mA (well above threshold). (c) High-resolution CW lasing spectrum from a 2.2 μm×2.5 mm narrow-ridge-waveguide laser at an injection current of 40 mA. (d) Measured CW L-I curve from a 2.2 μm×4 mm narrow-ridge-waveguide laser as a function of temperature. Fig. 5. (a) RIN spectra up to 16 GHz at gain currents of 40, 60, and 80 mA. (b) Measured RIN in the 6–10 GHz region with bias. (c) Relaxation oscillation frequency with bias. Fig. 6. (a) Experimental results. 25.6 Gb/s eye diagrams (a) at back-to-back (received power of −7 dBm) and (b) after transmission over 13 km SMF-28. (c) BER at different received power at back-to-back (square marker) and after transmission (circle marker) using threshold detection.